You know what this blog hasn't had for a shamefully long time - some decent Yildiray Cinar art. The dude is one of the rising stars of comic art and the amount of time he puts into sketching and evolving his skills (even as an already established pro), would put your nearest Olympic athletes to shame (except you Kazakhstan - your medal win is the best moment of the Games yet)! Back on a Turkish track, not only does Yildiray sketch like a madman, the current DC artist also pumps out behind the scenes vids of exactly how he creates his art. 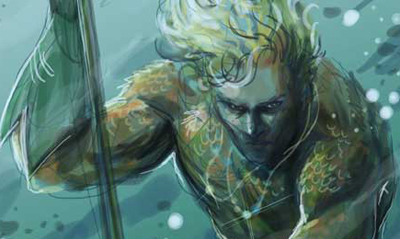 The latest, this one featuring DC's other 'rising star', Aquaman. Add in a sweet soundtrack by Portishead, and it's an inspirational wee drawing vid, worth diving into tide and time again. Pay the man his due, visit Yildiray Cinar online after the jump.